ThemeParkMama: Join Ryan's, HomeTown Buffet and Old Country Buffet for Family Game Night on Thursdays in June! #Giveaway! 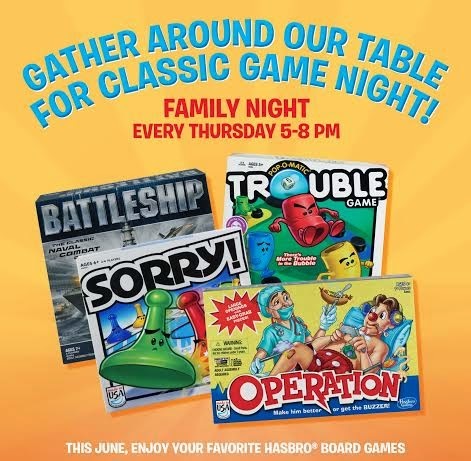 Join Ryan's, HomeTown Buffet and Old Country Buffet for Family Game Night on Thursdays in June! #Giveaway! Throughout the month of June, Ryan’s, HomeTown Buffet and Old Country Buffet are partnering with Hasbro again for an exclusive Family Night promotion. Every Thursday night in June from 5 to 8 p.m., families who dine at any of the restaurants will receive a themed activity sheet which includes a coupon for a 10% product discount from www.HasbroToyShop.com. The activities include tie-ins to family-favorite board games like Trouble, Sorry, Battleship and Operation. What better than to eat, play and enjoy your family than at Ryan's, HomeTown Buffet, or Old Country Buffet. I love that the games are easy to learn and that almost all ages can pick up on the game making for a really great time. One reader is going to WIN 2 board games (Sorry and Trouble) and a family 4 pack of passes to go to any of the following Ryan's Buffet, Hometown Buffet, Old Country Buffet, Fire Mountain, Granny's Buffet or Country Buffet! Contest open to U.S. residents only, will end June 25th!